Title: Pythagorean Women: Their History and Writings. Baltimore: Johns Hopkins University Press, 2013. Contents/Subject Matter: Pomeroy, a reknown classicist, gives us a summary of early Pythagorean life and social practices, settlements, doctrines,leading individuals and their extant writings. She distinguishes, on the basis of careful analysis of language, dialect and subject matter, early (original) Pythagorean from Neopythagoreans and divides the latter geographically, into writers of the east and those from the west. The entire focus is on the lives of women their prose texts and extant correspondence. The work closes with a chapter by Vicki Lynn Harper who originally translated many of these works in Volume 1 of A History of Women Philosophers (1987) edited by this reviewer. Quality of Scholarship: It is difficult to imagine any room for improvement in either the core contents--translated texts and letters by Pythagorean women--or the meticulous preparation Pomeroy gives us for contextualizing that content. Pomeroy, examining and interpreting artifacts, ancient edifices and settlements, gives the reader a clear sense of the nuanced lives of Pythagorean women. The only possible improvement could be in the size and quality of the photographic material which tends to be small and grainy. The inclusion of maps greatly aids our understanding of the various Pythagorean groups: their settlements, travels and sometimes, interaction. How does this work advance scholarship in this field? Pomeroy does not rely exclusively on Harper's English translations; some of the materials Harper previously published in translation are newly translated by Pomeroy in ways that subtly improve upon the quality of Harper's now quarter-century old renditions. 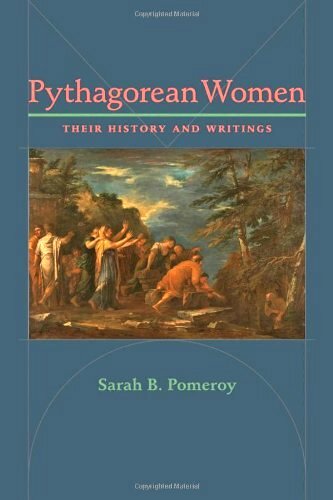 But most importantly, Pomeroy gives us the tools with which to further analyze these translations: the context of the lives, beliefs and practices of Pythagorean women across many centuries and across distant geographical settlements. Evaluation of Clarity of Writing, Organization, etc. This work is nicely written, well-organized, meticulously documented and a total pleasure to read. It will make it possible for instructors to integrate their teaching of Pythagoreanism along lines of gender, showing the prominent place of ancient women in ancient philosophy. Additional Remarks: This is a fairly brief work: xxii + 172 pages includes endnotes and index. A Bibliography would be appreciated, but can be culled by reading through the endnotes and abbreviations.